Selectfluor (Fig. 1) is a mild, reliable, effective, and stable source of electrophilic fluorine, which lends itself to large-scale synthesis and is commercially available [ 1]. In 1992, Banks et al. first reported its preparation and application as a competent reagent for the direct synthesis of organofluorides, including aryl fluorides [ 2]. 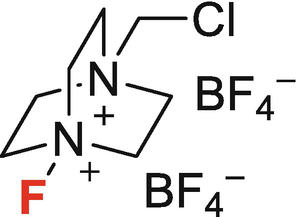 Since then, a variety of aryl fluorides have been synthesized by using Selectfluor as the fluorine source under transition metal-free conditions.